Personalized email campaigns that acknowledge recipients' birthdays or anniversaries are more successful at engaging their target audiences, generating higher open rates, transaction levels, and revenue, according to research by Experian CheetahMail. Among email campaigns studied, open rates for birthday mailings were over three times higher than for mass-promotion mailings sent to the same clients: 56.2% vs. 16.8%. Open rates for anniversary campaigns were nearly three times as high: 34.4% vs. 12.9%. 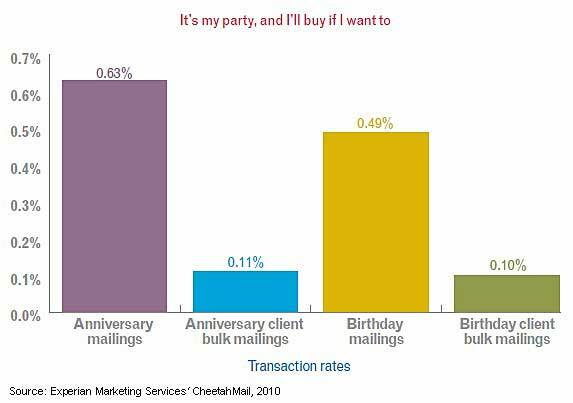 Moreover, transaction rates for birthday campaigns were nearly five times higher than standard bulk campaigns: 0.49% vs. 0.10%. Transaction rates for anniversary campaigns were nearly six times higher: 0.63% vs. 0.11%. Anniversary emails generated nearly seven times more revenue, on average, than bulk mailings to the same clients: $0.66 vs. $0.10 per email. Birthday emails generated over twice the revenue of bulk mailings to the same clients: $0.51 vs. $0.20 per email.